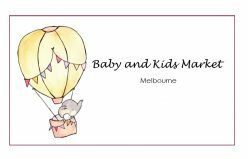 Upcoming pre-loved Baby and Kids Market: 15 June 2019 in Hotel520, Tarneit. Large items area where you can sell your prams, cots, bike etc. Plus lots of advertising to inform potential buyers of the date and location. Approximately 50 – 60 cm floor space beside your table for a clothes rack or small table.